Feeling a little cabin fever stir-crazy, I've been crazily motivated to find ways to let spring in the house (even if it doesn't appear to be OUTSIDE yet!). I made these curtains last week for our living room doors--they're replacing a heavy, dark green jacquard, and oh, it makes such a difference to have COLOR!!! I backed the curtains with an unbleached cotton muslin. Here they are (with Calvin, of course, who seems to always appear at the same moment that the camera does--never one to pass up a photo op!). 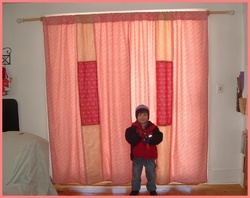 And by the way, I swear the curtains (and the sewing on them) are straight! They look a little funky in the photo. I also made a few pillows to match. I still need to make a couple more, but I'm waiting for the forms to be on sale first. ;) I got the down-like pillow forms, and really love them! 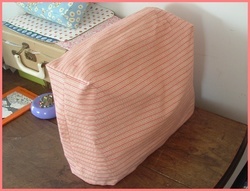 And then, I finally made a cover for my sewing machine. 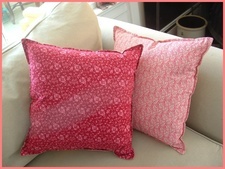 I used the flannel that was part of the pillow/curtain mix. I know, it's kind of boring, but I'm just so excited I finally made a cover after intending to do so for so long now!